Here are some more Manny related Isotope videos. Here is an interesting video from ESPN featuring Manny's Alma Mater, George Washington High School, and their thoughts about the suspension. You can see the disappointment in the eyes of one of Manny's mentors. Legendary Auctions has even more great photos from Sport Magazine in their auction; including a whole bunch of Dodger great Sandy Koufax. The photo below is nicely framed with Koufax's follow through, the ball (no doubt a curve) whizzing through the air and the catchers right shin guard. The contrasting black and white shades have my eyes moving in a counterclockwise direction as I can visualize the pitch coming towards the catcher. This is almost as perfect a photo as you an get of the Hall of Famer in action. Currently it is at $200.00. Now here is some good stuff. 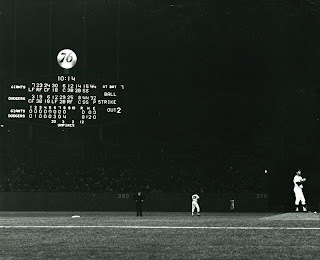 Below are some pics within a 7 photo lot of Sandy Koufax's 1963 no-hitter against the Giants. It happened on May 11th at Dodger Stadium as the Dodgers overwhelmed the powerful Giants, 8 to 0. 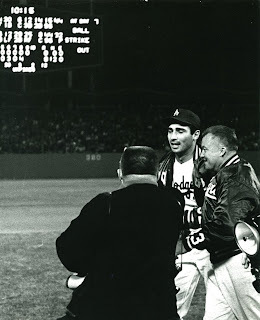 Koufax even took a perfect game into the ninth inning. Unfortunately, he walked the first batter up on a 3-2 pitch. Nevertheless, he finished up the inning without giving up a hit. 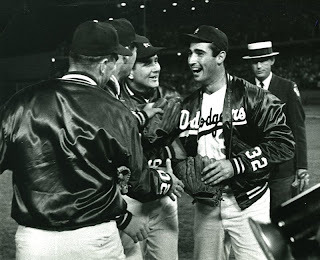 Overall, 1963 was a magical year as Koufax won the pitching triple crown (306 SO, 1.88 ERA & 25 Wins), the MVP award, Cy Young and the Dodgers sweeped the Yankees in the World Series. 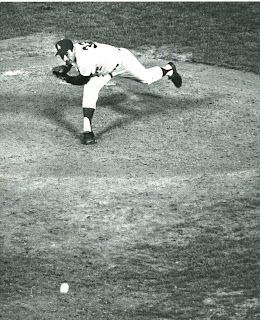 Of course, Koufax won both ends of that series. Yogi Berra commented after game one, "I can see how he won 25 games. What I don't understand is how he lost five." 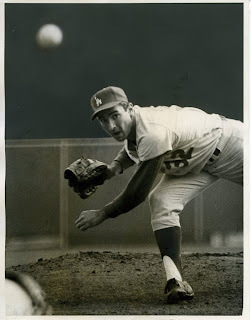 The below pic shows Koufax preparing the ball just before he makes his pitch to the last batter. Notice that it's the top of the ninth inning with two outs and no count. Koufax looks happier than Homer with a doughnut, but the usher in the background looks unhappy. He must be a Giants fan. So far, this auction is at $175.00.